John Spade was the son of Emma Carson and Esta Spade. He was born on September 24, 1916 in San Diego CA. He attended primary and secondary schools there then went onto San Diego State College receiving his Bachelor of Arts Degree, then his Master of Arts Degree at the University of California – Berkeley, where he also received his administration credential. Later he attended the University of Mexico City for Spanish studies. In John’s early years he enjoyed reading. It was said that he would read up to five books a week. His favorite reading was Science Fiction. In his later teen years he also drove a tour bus for the San Diego Zoo. Before the war John married the love of his life ‘Ruth Wiegand’ in 1939 which he was with for over 53 years. They met at the University of California – Berkeley. Ruth was born in San Antonio, Texas and lived in Argentina for a time during her youth. John entered World War II and was dispatched to Germany and was shortly captured in the Battle of the Budge. He was reported as missing in action, his wife spent several months as a widowed single mother before learning that he was a prisoner of war. He and Ruth had 4 children. Barbara who passed at 16 months; David and Robert, both graduates of Alhambra Union High School and both Valedictorians in their graduating classes; and daughter Sharon Spade Hart an Alhambra graduate who is the last surviving family member, now residing in Oregon with her family. Parts of this biography have been provided by her memory and publications of the day. Following both of their graduations from Berkeley they moved to Martinez where they spent the rest of their lives. Ruth taught Spanish at the Junior High School and later at Alhambra High School. John spend this first five years as a teacher at the Martinez Junior High School, then moving up to the high school as a teacher for the next 15 years, he taught English and Spanish at both schools. He was promoted to Dean of boys at Alhambra in 1955 under Principal Dr. Grenville Jones. 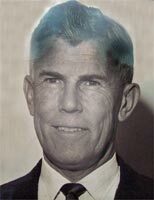 In July 1, 1960 he succeeded Virgil Bozarth as principal of the Martinez Junior High School. The Board of Education appointed him to that position in a 4-1 decision, after interviewing eight finalists. He served as Principal of the Junior High School until his retirement on June 30, 1977. John was a member of the Congregational Church in Martinez, singing in the choir; president of the Martinez Kiwanis Club in 1968; a member of the Martinez Masonic Lodge #41; and an active member of the Boy Scouts of America. He always would say – family first always. It is noted that once his children moved out of the family home not a week would go by without sending each of them a letter along with his mother. His vacations (even with family) were always to further his knowledge and education about this great country of ours and its history. John passed onto the Lord on August 15, 1993 at the age of 76, after a long bout with bone cancer. His ashes were scattered in San Francisco. Ruth passed on December 17, 2008 at the age of 93. He had the rare quality of lifting one eyebrow which would command attention of his students, something unheard of in today’s student/teacher world. Mr. Spade was a well loved and respected educator and administrator in the Martinez School system. His tenure in Martinez saw the ushering in of the Martinez Unified School District in 1963. Being a principal of the Junior High he played a major role in the formative years of the MUSD. For those of us with a little gray in our hair, he will be forever remembered. These and other stories about Martinez History, Alhambra High School and the history of Martinez education can be found in the ‘History Section’ of the Alhambra Alumni Website at http://www.AlhambraAlumni.org.